Hard to believe it’s already that time of year, the bittersweet moment we begin to part ways with our beloved toques and parkas. It’s been an unpredictable Canadian Winter, and we’re ready for you, Spring! Our Ottawa build is coming along swiftly and we’re happy to announce that we can now add autonomous boats to our growing list of animated features. Also, signature buildings such as the Library of Parliament, Chateau Laurier and Connaught Building are nearing completion so stay tuned for the unveiling of all the tiny surprises within. There is still much to do but with each small step we’re getting closer to launch. Rome wasn’t built in a day and neither is our miniature nation’s capital! Also, outreach on both the big and small investor campaigns continues. We’re nearing completion of the key documents required for our small investor FrontFundr campaign GO LIVE date. Stay tuned for the announcement and your opportunity to own a little piece of the country you love! Our miniature family is growing, and recently we’ve welcomed our newest Canada Builder, Razi Ahmad. Razi has been a volunteer with us since the beginning of January and with him he brings incredible architectural experience. Our miniature Ottawa River is seeing some unseasonal boating traffic with the introduction of our autonomous cruising boats. We have to give a big shout out to our tech gurus and vehicle specialists Dan, Norm and James for making our miniature Canada a moving and working reality. From trains to autonomous cars and now boats, creating this animated world takes patience and occasionally some colourful language, but the results are magical. Check out this video to see our tiny boats in motion! They’ve done it again! The master builders at Miniatur Wunderland in Hamburg, Germany have completed the Venice exhibit to add to their representation of miniature Europe. The smallest of all their exhibits, the build of miniature Venice spanned over 35,000 hours in an area of 9 square metres. Just in this space alone, they have 3,000 figures, 4,000 LED lights and 17 push buttons unveiling new technology and surprises scattered throughout the tiny rivers of Venice. It’s easy to see why Miniatur Wunderland’s attendance continues to grow year after year – surpassing 1.4MM visitors in 2017! Watch and be amazed at the detail, the stories and amazing craftsmanship that went into building this miniature version of Venice. After a few months of fun and exposure at the Selftraits 3D printing studio on Queen West in Toronto, we’ve packed up our PopUp store. Thank you to everyone who visited us while we were there. We’re thankful for the many mini memories we made and shared with you all. And a big thank you to the Selftraits team for welcoming us into their space. 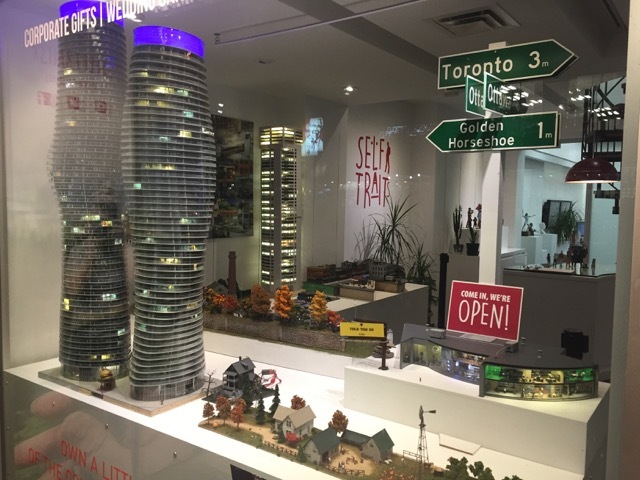 We continue to have big plans for our 3D printed mini-me figures, and you may see us PopUp again at Selftraits new retail studio, at 36 Fieldway Drive in Etobicoke.